The times are rough, but also fast at the same time, and we have got to keep up with it to ensure a decent living. If not for our own sake, most of us who have families with children to raise do have a lot on our plate. We have to make sure that the kids are supervised and not neglected, the house is on point, and at the same time, we can make enough money to be able to support our families. Many parents have to leave young kids at home at the mercy of nannies and caretakers because they have to go out and earn a living. Unfortunately, with the increasing crime rates, even nannies cannot be left unsupervised, and some surveillance becomes mandatory. When you are stuck up in between a plethora of problems, imagine if there is a one-stop solution that cleans your house, keeps you connected to your family and enables you to speak to them and monitor them remotely from anywhere while you are on the move. It could be very frustrating to invest in half a dozen surveillance cameras and equipment that only send you an audio/ video output, another set of investment in communication gadgets and a separate investment in cleaning equipment. Under such circumstances, it would be a blessing if there is one gadget that single handily takes care of all your worries. This is where the camera-enabled Robotic Vacuum Cleaners come in to play. These revolutionary babies are a vacuum cleaner, anterner, and communication device and a camera all at the same time. It is worth every penny to invest in these robotic vacuum cleaners. Here is how you can use this miracle machine to survey your home remotely, while it also cleans your house and keeps it spotless. This vacuum cleaner comes with an Ethernet device that enables it to connect it with WiFi. This means that it is vacuum cleaner that can also be connected to the Internet and lets you stay connected to your household. The added feature of a camera on this vacuum cleaner send you an audio/ video output while it is connected to the Internet. Since the vacuum cleaner is mobile and has an Internet and camera feature, it enables you to survey your living space whenever you want. The bonus feature is that it has ancillary cellphone apps allow you to control the robot device from a remote location. Other than the mobility, Internet, and visuals, this robot vacuum cleaner also allows you to video chat using VOIP from a remote location. As a result, you cannot only keep a visual check, but you can also stay in touch with the members of your household. 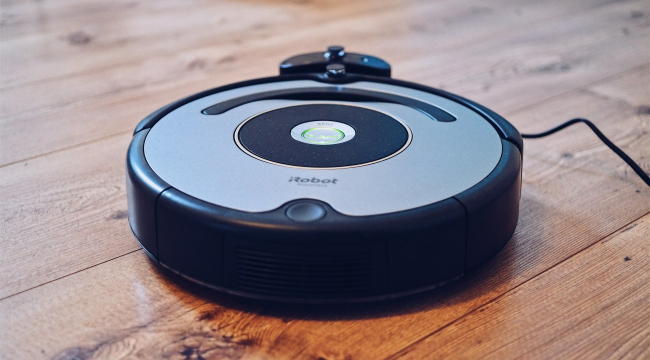 With a camera-enabled robotic vacuum cleaner, you can not only ensure that your home remains well managed, but the robot's mobility and the built-in Internet and communication system provides thorough surveillance of your space while you are away.